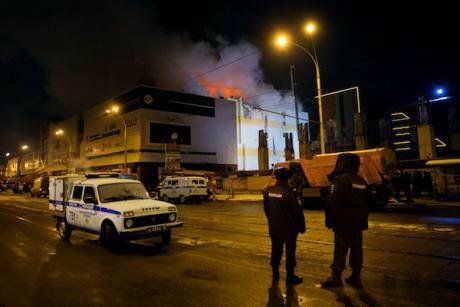 Kemerovo's Winter Cherry shopping centre, which caught fire on 25 March, killing 64 people. Photo: Kommersant Photo Agency/SIPA USA/PA Images. All rights reserved.When the Winter Cherry shopping mall in Kemerovo, Russia caught on fire on 25 March 2018, Russia’s citizens found themselves glued to televisions anxious for updates. With 60 dead, among them 41 children, the fire was classified as the second largest in Russia in recent years. However, what the Russian public saw on TV wasn’t so much news updates about the conditions of the victims or condolences from president Vladimir Putin, or news of a thorough investigation into what caused the tragedy. Instead, anchormen and women, their suits pressed, their most serious masks on and hair conservatively styled, dove into demagogic tirades, highlighting the importance of national unity at a time of crisis in the face of an ephemeral enemy. “It doesn’t necessarily have to be an external enemy,” says Russian journalist Alexandrina Elagina, speaking in the aftermath of the tragedy in Kemerovo. “These could be terrorists, or ‘western partners’, or enemies of the people and the fifth column. This is where the shenanigans begin,” she adds, speaking of the punishment of the low-level officials that usually comes next, while top-tier management is left untouched. But Russia’s state and pro-government media, the principle news sources available to Russian citizens across the entire country, continued their deceitful harangue on why this fire was an attack on president Putin and why the people should unite with the government against western threats, instead of questioning the authorities and expressing discontent over the handling of this crisis. That the media take cues from state authorities in the immediate aftermath of a serious event or a disaster is nothing new. As Maria Tomak of the Media Initiative for Human Rights in Kyiv recalls, one of the oldest examples, as well as the most tragic, is the Chernobyl nuclear reactor meltdown in the waning days of the Soviet Union in 1986. For days the Soviet media refused to report on the incident until after the international broadcasters broke the story. Media practitioners across Eurasia interviewed for this article agree that the underlying problem is often government negligence. When it results in mass catastrophes, authoritarian governments do their best to shift the blame and make sure they are in control of public reactions. In doing so, they attempt to distract the public and divert its attention from its own complicity in the unfolding events. Alasgar Mammadli, a media rights lawyer from Azerbaijan, cites a few examples of clear mismanagement in this South Caucasus state, such as the deaths of more than 30 oil rig workers due to high winds in the Caspian sea, and a fire in a high rise in Baku because of fake decorative panels that turned out to be highly flammable in 2015, the burning down of an in-patient drug treatment facility that resulted in three dozen deaths, as well as the deaths in the April 2016 flare up of the ongoing conflict with Armenia. In all of these cases the Azerbaijani authorities first attempted to minimise the tragedy and then divert the focus to other news, which seems to be the usual modus operandi. 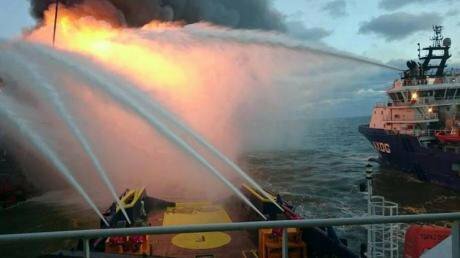 At 5:40 pm on 4 December 2015, a heavy storm and high waves swept through an underwater gas pipeline on the Guneshli 10 oil platform. Photo: Meydan TV. All rights reserved.Lobar Islamova, editor of Anhor.uz news site in Uzbekistan, says autocratic governments seek to portray themselves as faultless, whereas they are quite often the ones at fault. Citing the Andijon tragedy, when Uzbek security forces fatally fired on protesters in 2005, Islamova says there’s a litany of serious and uncomfortable questions regarding the government’s failure to prevent a peaceful resolution of this conflict, and in order to conceal information, autocratic governments are forced to initiate mass repressions, as it happened after the Andijon events. In the immediate aftermath, the Uzbek authorities limited media access to the city, and let only those local and international (mostly, Russian pro-government) media that would support their narrative: that the crackdown was an anti-terrorism operation. To ensure the victims of the Andijon crackdown didn’t talk to independent media and reveal the truth, the authorities arrested them, and also threatened their families. “People were thrown in jail on hastily put together charges with little regard for the authenticity of the evidence… while their relatives were threatened not to disclose the arbitrary jailings to the public to avoid bringing more harm upon their arrested family members,” Islamova adds. What often follows after tragedies like Andijon is an attempt to downplay the tragedy through mass media. “We see it in a systemic fashion, as the media are directly controlled by the government or the people connected to it, so the first effort is to minimise the scale of the event, to move it to the backburner to the extent possible, and switch the agenda,” says Alasgar Mammadli. Mammadli notes that these attempts usually unfold on TV because these channels are precisely the ones under control. “They bring completely (irrelevant) people into the agenda,” he says, describing a notorious case when a TV host on Azerbaijan’s ATV channel, Matanat Aliverdiyeva, seemed to call people not to blow the 2015 Baku apartment block fire – which resulted multiple deaths, including children – out of proportion. “This was just like the wind that’d blown over us, as if we’d watched a horror movie,” Aliverdiyeva said on her live show, pointing to the fact that the tragedy was done and over with, seemingly urging people to move on. These comments enraged a huge chunk of the Azerbaijani public, many of whom called for her dismissal. Mammadli says in these situations the goal is to prevent the unifying of mass protest and directing it towards a singular target, and, instead, to create a number of smaller alternative targets and direct the attention there. He calls it a purposefully done, controlled process. “It’s not just a statement by someone who misspoke or said something ignorant. This is something that was planned consciously because everybody knows that at the end of the day, be it a social issue or a natural disaster, behind all of them there is either an element of corruption, or bad governance, if you look deep enough. And the protests, as the result, will be directed at the government,” he adds. After ammunition depots in Vinnytsia region catch fire, people wait near a security forces check point to be allowed to take some their belongings from abandoned homes. September 2017. Photo: NurPhoto/SIPA USA/PA Images. All rights reserved.In cases when minimising the problem doesn’t work, there’s always an internal or external enemy that could come handy. Zebo Tajibayeva, editor of the Asia Plus news agency in Dushanbe, says in Tajikistan there’s a popular pro-government narrative that states that anything is better than the 1992-1997 civil war. At different times, the Tajik state, and media close to it, create false narratives of neighbouring Uzbekistan as an exterior enemy, as well as painting the Islamic Renaissance Party and the former United Tajik Opposition members-turned-militants as internal enemies. Maria Tomak echoes this sentiment, saying that this kind of “enemy manufacturing” narrative is well-known even in seemingly pluralistic countries like Ukraine. 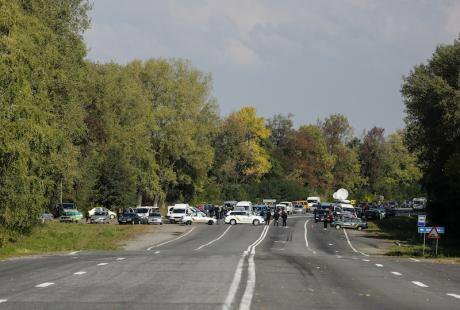 She cites an example of a series of explosions at military ammunition warehouses in central Ukraine last year which were blamed on the Russian Federal Security Service without hesitation, while it might have been a simple result of negligence on the Ukrainian side. But when the media as a source of news and facts is reduced to nothing more than a trumpeter of government propaganda in former Soviet republics, their citizens no longer view these outlets and journalism as the fourth estate – one that would inform them of the true dealings of the government. Zebo Tajibayeva says that in rural areas in Tajikistan, where state media are often the only sources of news, there is still some trust towards them. However, she adds, in areas where populations have access to more media and alternative sources of information and fact-checking, propaganda media outlets – and the media in general – often lose their credibility. Lobar Islamova says even in Uzbekistan, where access to information has for years been severely restricted, government media are treated with a grain of salt. “For years people have been calling the Akhrobot, (state TV news) program ‘News from Heaven’. But nobody believed or paid attention to them. All these state newspapers and media were able to sustain themselves till now only due to government subsidies,” she adds. Tomak says that a similar trend can be observed even in a country like Ukraine, where the media scene is rather vibrant, and freedom of expression does exist. “The largest channels in terms of ratings and audience in Ukraine belong to oligarchs and industrial groups, and, therefore, we can’t talk of healthy pluralism. And while, on one hand, the media is often seen as an instrument of upholding the law, there is also apprehension that they are lying,” she says.